Our bestselling tour combines the greatest treasures of the National Park with real hiking! 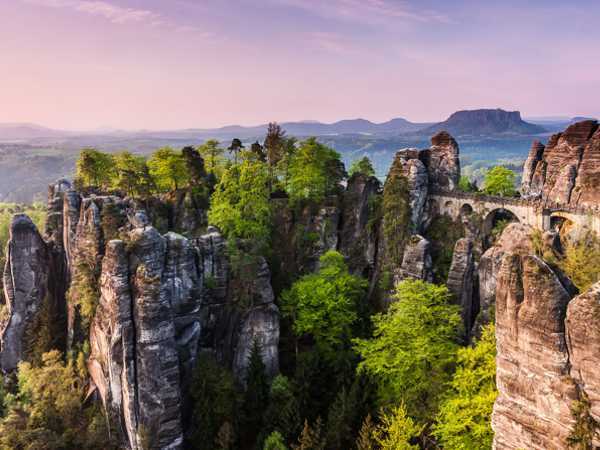 This 1-day trip from Prague will take you high up to the sun-warmed viewpoints of the impressive Elbe sandstone massif, as well as deep down into the green mysteries of its gorges. We will follow the trail of the most memorable spots this region has to offer. Now let’s give you the facts: We will pick you up at your hotel. The van is comfortable and WIFI connected. Our small group of most likely quite inspiring people will drive north for 2 hours, then stop and dive into the woods immediately. Because you know what? When you only have 1 day, there is no time to waste! 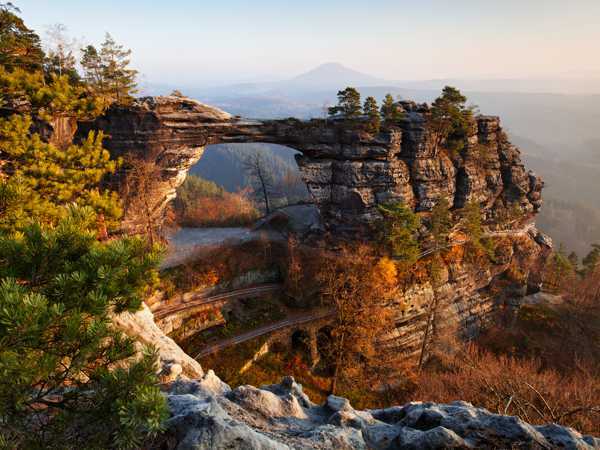 You will climb & clamber up the forest paths and the rocky tracks, leading to the largest sandstone arch in Europe. But once up on the Pravcicka Gate plateau, you will feel airy from the smell of the pines, the warm breeze and the magnificent, faraway views. Then your singing stomach will drag you to the next treat: a delicious á la Carte lunch and a craft beer at a really good restaurant offering the best from the local food scene. Choose what you like from the irresistible menu. You deserve it! And it’s all included in your tour. And finally, down into the realm of the water! 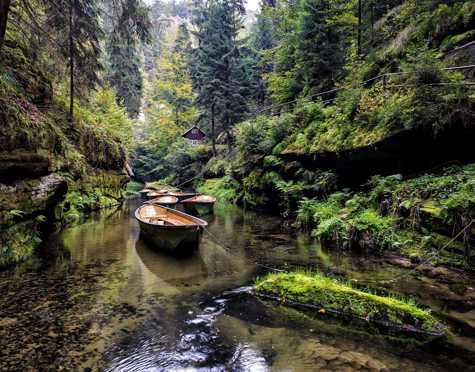 You will experience a soothing boat ride through the Kamenice river gorge, maybe even with a little surprise at the end. Well, now you got the facts. Let’s hope it ignited enough fire in your heart to book the tour, pack your outdoor boots and get your camera ready! Are you up for a bit of romance? 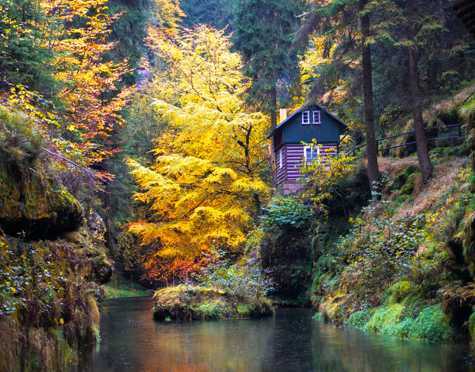 Surprise your love with a 1-day trip from Prague! 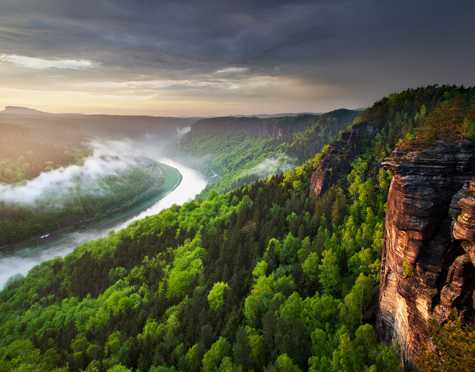 Fill your smog-clenched lungs with some fresh air rising from the sandstone canyons around the Elbe river. Contemplate those life changing decisions at the breathtaking viewpoints, feeling like on top of the world. Find the answers you are searching for. Let the nature (and us) guide you! So what exactly is there to look forward to? 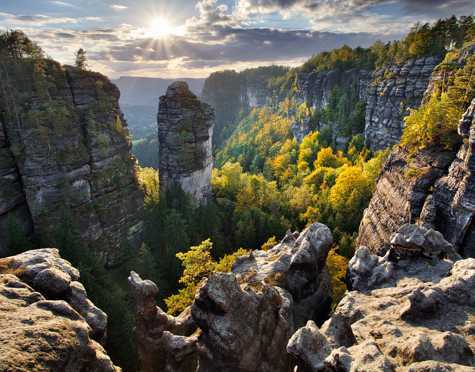 You will walk the famous, sky-scraping Bastei Bridge, then immerse deep down into the green of the forest. We will lead you through the labyrinth of high-rising rock towers and take you for a mystic boat ride in one of the gorges naturally formed by the river Kamenice. Combining the greatness of the best Bohemian Switzerland sights with some easy hiking, a meal and drinks of your choice in one of the best local restaurants, a helpful guide who knows the spots for pictures that will pile up the likes and hearts under your Facebook or Instagram post, and the comfort of the WIFI connected van driving you for this adventure from and back to your Prague hotel – those are the ingredients that make our recipe for an easy, 1-day outdoor trip outside the city just perfect. This tour is our true romantic treasure. And in case your romance has already proved productive, then don’t worry to take the kids along. If they are used to do a bit of walking, they should manage too! IČ: 06686711, DIČ: CZ8705142589. VAT payee. Registered in the Commercial Register kept by the Municipal Court in Prague, Section C, File 286916. SAVE 20 € PER ADULT PERSON NOW. Valid for any new booking and any tour date in 2019. Must be made during January.